A new twist on upside-down cake, pecan pie and peach cobbler. Photography courtesy California Tree Fruit Agreement. This is Page 4 of a 5-page article. Click the black links below to view the other pages. 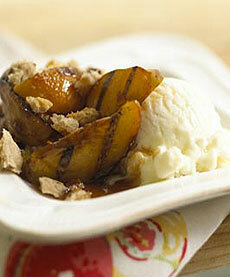 For more stone fruit recipes, check out our summer plum article. It wouldn’t be a peachy meal without peach pie. This recipe combines an upside-down cake, a pecan pie and peach cobbler for a delicious summer treat. Recipe yields 1 pie. Preheat oven to 325°F and lightly butter a loaf pan. Stir together flour, powdered sugar, pecans, crystallized ginger and 1 teaspoon cinnamon. Add in 1/2 cup butter and mix well to form a soft dough. Press into the bottom of prepared pan and bake for 25 minutes. Set aside to cool, then break into a rough crumble, leaving some larger and smaller pieces. Melt remaining butter and cinnamon with brown sugar in a large bowl in the microwave. Toss fruit in butter mixture then grill over high heat for about 1 to 2 minutes on each side to lightly brown. Remove from grill. Place ice cream in bowls and top with warm fruit and sprinkle with crumbled shortbread.